Bess Harding - Blog: Oliver! This afternoon I went to a talk by artist/illustrator Oliver Jeffers at the London College of Communication. I was looking forward to it like you wouldn't believe, because Oliver is my absolute favourite book author/illustrator (well, 'maker' in his own words), and I'm mildly obsessed with his work (than doesn't make sense but I want to get across that I'm not scarily obsessed, despite what comes next)... 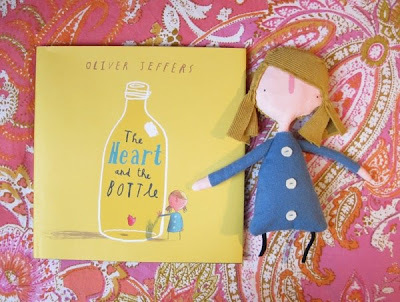 The girl in his latest book, The Heart and the Bottle, is so sweet, I decided to have a go at making her as a doll to give to Oliver. 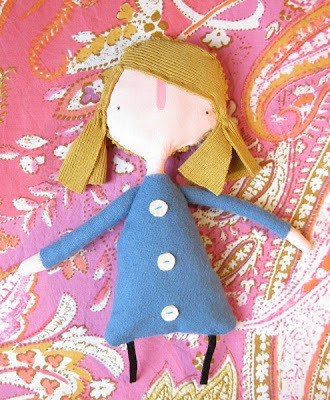 She didn't turn out exactly as hoped - head too wide, dress too dark, arms too long - but I handed her over in a brown paper package as I was getting my booked signed, and fingers crossed he likes her! Oliver Jeffers is great - we sell some of his designs on cards at work, they're really sweet!